Tiger Woods' last trip to Thailand as a golf professional in early 2000 was a bit of circus. Politicians, media and other VIP’s almost stormed his plane when it touched down in Bangkok even before he could get his seat belt off. A lot of Thai golfers don’t see Tiger in a favorable light. Even though his mother is Thai, very few Thai’s see Tiger as even half Thai. In typical Thai fashion they think he should be sharing some of his wealth for the country, as do other local Thai golf superstars like Thongchai Jaidee and friends. "He basically has forgotten the Thai people," says Prasong Pathom, a medical doctor who watched Tiger Woods play at the 1998 Honda Classic at Thai Country Club and comments "He is a great golfer and has done some good with his foundation in getting equipment for young kids, but a number of Thais see it as nothing more than a token gesture." 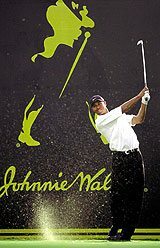 In 2000, Woods received an appearance fee of $1 million to compete in Bangkok at the Johnnie Walker Classic at Alpine Golf & Sports Club. In fact, the yet-to-be famous and now-ousted Prime Minister Thaksin Shinwatra is reported to have paid for the bill in exchange for a few photos with the reigning US Open champion. Being a council member of Kasetsart University, also located near many golf courses in Bangkok, Thaksin was also heavily involved in arranging Tiger Woods' receiving an honorary doctorate of philosophy in golf sports from this school. Woods’ schedule was as usual tight, and he agreed to receive it only if the ceremony was held at the hotel and lasted 15 minutes. Once again, this didn’t go down to well with some Thai’s, with one student complaining "It took him 15 minutes to get something that took me four years". During his last round at Alpine Golf & Sports Club, he was also confronted by about 100 Nike ex-employees who had just been laid off, one of who predicted it would take 72,000 years for them to make the 100 million that his deal with Nike was worth at the time. Nowadays Tiger is revered as much as anywhere around the world but the Thai’s do not claim him as one of their own. Given the controversy surrounding his last Thailand golf visit do not hold your breath waiting for Tiger Woods to return back to Thailand.